Nestled in the heart of Tianhe District -Teemall / East Railway Station, La Perle International Hotel is an ideal spot from which to discover Guangzhou. From here, guests can enjoy easy access to all that the lively city has to offer. No less exceptional is the hotel's easy access to the city's myriad attractions and landmarks, such as Gangding Metro Station, South China Normal University Metro Station, Shipaiqiao Metro Station. Offering hotel guests superior services and a broad range of amenities, La Perle International Hotel is committed to ensuring that your stay is as comfortable as possible. Restaurant, 24hr room service, elevator, car park, safety deposit boxes are just a few of the facilities that set La Perle International Hotel apart from other hotels in the city. Experience high quality room facilities, including shower, daily newspaper, desk, mini bar, hair dryer, to help you recharge after a long day. Besides, the hotel's host of recreational offerings ensures you have plenty to do during your stay. 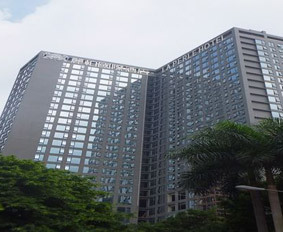 La Perle International Hotel is an ideal place of stay for travelers seeking charm, comfort and convenience in Guangzhou.